Taking the step up from producer to director, with Love & Mercy (2014) Bill Pohlad successfully delivers a biopic like no other – a tale of endurance based on the turbulent life of Beach Boys member and solo artist Brian Wilson. The brilliant double-team of Paul Dano and John Cusack play Wilson at different but no less important crossroads in his life, the film switching between timelines to accurately capture the frailty of a man charged by music yet troubled by his mind. In the present, Brian (Cusack) meets car saleswoman Melinda (Elizabeth Banks), who becomes an important figure in his life as he attempts to piece himself together, much to the dissatisfaction of psychotherapist Dr. Landy (Paul Giamatti). This is punctuated with scenes from Brian’s earlier life, after the band’s initial success as they attempt to remain current. Brian (now played by Dano) urges the band to let him stay in America to produce, only for his worsening mental disorder to take over and send him on a troubling downward spiral. A tremendous amount of credit for Love & Mercy’s success is owed to the work of Cusack and Dano. Both capture different aspects of Brian’s psyche at intrinsic moments in his life. Dano perhaps has the edge, delivering a full-throttle turn that sees him with meaty material to work with. In the modern day scenes, Cusack shares the workload with Banks, who steals much of the focus. It’s a refreshing rarity for a female character in a male-led film to have such impact. The narrative is split evenly between the dual timelines, the script utilising the symmetry in Brian’s life to make the transitions seem natural rather than irksome. It allows for the issues Brian faces in his latter life – a struggle to find his voice and escape the torment of a overwhelming figure – to mirror similar difficulties faced in his earlier life when he was finding his voice. The powerful drama is punctuated with brief moments of humour and tenderness, which brings added authenticity and heart to the film. 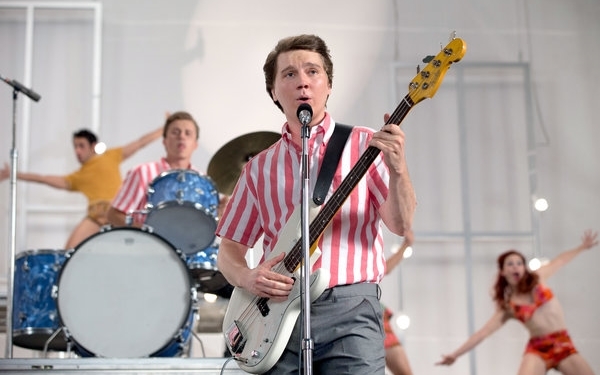 That said, unlike other biopics, Love & Mercy never shies away from the harsher aspects of Brian’s life. In fact, it pushes them into focus, recording with care and honestly the unpredictable labour of love creativity can be and, perhaps most importantly, how crucial it is for mental illness to be managed. Love & Mercy is a quiet revelation – an unconventional biopic that’s masterfully executed and fascinating to watch. This review was originally published as part of our coverage of the 2015 Edinburgh International Film Festival.